Below is the full text of a statement by UK Prime Minister Tony Blair on Tuesday's surprise visit to Baghdad, where he was greeted by his Iraqi counterpart Iyad Allawi. The two leaders also took questions from reporters. I feel a great sense of honour and also humility at being here and I would like to thank you for your leadership and the immense courage that you and your colleagues have shown. I've just visited members of the electoral commission and met some of their staff, and I said to them that I thought that they were the heroes of the new Iraq that's being created because here are people who are risking their lives every day in order to make sure that the people of Iraq get a chance to decide their own destiny democratically. And I'd just like to say this very strongly to the outside world, whatever people's feelings or beliefs about the removal of Saddam Hussein and the wisdom of that, there surely is only one side to be on in what is now very clearly a battle between democracy and terror. On the one side you have people who desperately want to make the democratic process work, and want to have the same type of democratic freedoms other parts of the world enjoy, and on the other side people who are killing and intimidating and trying to destroy a better future for Iraq. And I thought when I saw that... just how important it was for people to recognise this is now about the future. Interestingly, talking to some of the United Nations staff that were there as well - their very, very strong commitment to making sure the elections are held and also their belief from the work and the conversations they've had that people in Iraq actually do want to participate in this. So I hope very much, like you prime minister, it goes ahead on an inclusive basis - I'm sure it can do and should do. Also of course, as we build up the capability of the Iraqi security force - the police and the army and the other forces - of course that then brings forward the day when the multinational force can leave and then Iraq is there with the people in charge of their destiny, with Iraq in charge of its own future, and with Iraq as a stable and democratic partner for this region and for the wider world - and that is a vision that everybody, not just in Iraq but everybody in the whole of the international community should support. And as I say, I feel a sense of humility, I know it's a very tough challenge - you can see that and feel it being here. I'm sure that there are parts of Iraq that are very much calmer but here in Baghdad you feel the sense of the challenge and the difficulty that there is. I've nothing but admiration for you and for your colleagues and everyone here, whether from the international community or Iraqis who are trying to make this country better, and you deserve our praise and our support and also our gratitude because you're striking an important blow for democracy everywhere. Q: Andrew Marr: Many thousands of people have died for this moment, including scores of British people, are you sure that this prize [word indistinct] was worth that price? 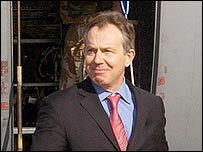 Tony Blair: When I meet the people working alongside the United Nations - Iraqis in fear of their life every day, because they are trying to bring freedom and democracy to their people - when I see their courage and their determination and know that they speak for the vast majority of people in Iraq who want that democracy and freedom, then I know that we are doing the right thing. And whatever people felt about the original conflict, we the British aren't a nation of quitters. What's very obvious to me is that the Iraqi people here, they're not going to quit on this task either - they're going to see it through. And just imagine the difference that a stable and democratic Iraq would make - not just to people in Iraq but throughout the whole of the region and the world - now when I see that, yes, I believe we did the right thing. And I will also say this to you, there are people dying in Iraq but the reason people are dying is because of the terrorism and the intimidation and the people who are deliberately killing anyone trying to make this country better. Now what should our response be as an international community? Our response should be to stand alongside the democrats - the people who've got the courage to see this thing through - and help them see it through. I've got no doubt at all that that is the right thing for us to do. Iyad Allawi: May I just interject here. Of course we in Iraq do greatly appreciate the sacrifices of the British people - the brave soldiers of Britain and other friendly nations. I assure you that all were for a very good cause. It's a cause not only to bring democracy to Iraq and to the Iraqis but to ensure peace and stability in the region as well as in the world. Q: Journalist: Mr Allawi how worried are you that... democracy that you want in election is going to be meaningless because there are going to be so many, particularly Sunnis, who don't vote and would you in any circumstances consider postponing the elections - waiting for stability to be restored? Mr Allawi: No we are pressing ahead to have the elections on time. We are committed to have the elections on time. The majority of Iraqis are excited to have the elections on time. Definitely our enemies are determined to break our will - they will not prevail - we will not allow them to prevail. We are continuously engaged with the various constituencies of Iraqis to participate - we want it to be an inclusive election - we want everybody to be part of this election. We have been talking to the various elements and personalities - tribal leaders of all inclinations, backgrounds - to be part of the elections. We believe very strongly that as we move progressively in the political process, this would have an impact also on security - improving security. We have always expected that violence would increase as we approach the elections but I am sure that the Iraqi people with the help of our dear and good friends in the international community, we are going to be able to achieve this goal. Q: Female journalist: What guarantees or at least hopes are there that the situation will get better after the elections? Tony Blair: I think... I mean obviously as the prime minister has just [said] there has been a concerted attempt to try and break our will over the elections... And I think that everyone understands that obviously there will be violence that will continue even after an election. On the other hand, we will then have a very clear expression of democratic will. And what is interesting to me was talking to the United Nations officials here who were first of all absolutely committed to the electoral process and secondly said to me in the strongest terms that all the work they were doing in every part of the Iraqi community indicated people actually do want to participate. There is intimidation in certain areas but no shortage whatever of people's desire to participate in democratic elections. And as actually we saw in Afghanistan, once those elections take place, they have their own momentum. So I'm not in any sense dismissive of the problems - there are major problems, of course there are - but I think holding the elections will, as the prime minister was implying a moment or two ago, have its impetus towards greater security. Q: Nick Robinson, ITV News: Can you just give us a sense of your feelings today? You flew here in secrecy under armed protection into what is still a safe zone more than a year and a half after Saddam fell. Can you honestly say to yourself, this is what I meant to bring about when I said that we ought to invade Iraq? Tony Blair: That's a good question. I'll tell you exactly what I felt coming in. Security is really heavy - you can feel the sense of danger that people live in here. There is another choice for Iraq - the choice is democracy, the choice is freedom - and our job is to help them get there because that's what they want. Sometimes when I see some of the reporting of what's happening in Iraq in the rest of the world, I just feel that people should understand how precious what has been created here is. And those people from that electoral commission that I described as the heroes of the new Iraq - every day... a lot of them aren't living in the Green Zone, they've got to travel in from outside - they do not know at any point in time, whether they're going to be subject to brutality or intimation even death and yet they carry on doing it. Now what a magnificent example of the human spirit - that's the side we should be on. Mr Allawi: I'd like to add a few points to what Prime Minister Blair has said. Iraqis do not see what happened as an invasion. As I clearly said that we deeply appreciate the commitment of the international community to have helped the Iraqi people to rid Iraq of a tyrant and to stand with us in fighting terrorism. Frankly, what you see now, the security, is a manifestation of a war that is being waged against us by evil forces. We have to stand firm, we have to stand tall, we have to defeat the insurgents. We have to defeat the evil forces, we have to defeat terror. And this is really to protect the whole world and the generations to come. We are adamant that we are going to proceed with the democracy, with the freedom, with the rule of law, with the respect of human rights - these are the important values that have been brought into Iraq. And for the first time the Iraqis feel the sense of liberty - it is a dream which has become true - we don't expect forces assembled against us just to stand idle to see this huge construction going ahead in a peaceful way. This what you see now, will disappear in the very near future. Q: Female journalist: You came to power six months ago... saying that Iraqis could do it better than the Americans. What went wrong? Mr Allawi: I still think that Iraqis will do it better - can do it better - than the multinational forces. We are deeply appreciative of the role of the multinational forces. We are moving ahead and building our own security. There are constraints, definitely for various reasons. But we are much better off than we were six months ago. We now have some army. We have some police. We are active. The Iraqi army and the Iraqi police spearheaded the cleaning up of Falluja. We are still developing our capabilities in the field of security and this is what we have been even discussing today in fact with Prime Minister Blair and we hope that we can expedite until such a point that the Iraqis themselves will be shouldering responsibility. Tony Blair: If I could just make one final point as well leading up to something that the prime minister has just said. He made the point that it was important for the future of the world, for the future of everyone not just Iraq - I want to emphasise that. Sometimes people say to me, what has this got to do with Britain's security? It has got this to do with Britain's security. If Iraq becomes a stable democratic country and we defeat the terrorism here which is the same type of terrorism that we face the world over - if we defeat it here, we deal a blow worldwide. If Iraq is a stable and democratic country, that is good for the Middle East and what is good for the Middle East is actually good for the world, including Britain - that's why it's important for us too.